If you’re heading to the south coast of Cornwall, be sure you take time to stop in and visit Mevagissey while you’re here. One of the area’s prettiest little fishing villages, it has something for all the family to enjoy, whether you like food, shopping, local culture or nature. Getting here is easy. By car it’s just a short hop from the A390, and there’s a decent sized car park called The Willows, run by very friendly folk, just as you enter the village. You can also get a bus from St Austell train station, or a ferry from Fowey, just up the coast. Once you arrive, you’ll want to begin by exploring the village, which centres around a collection of narrow streets packed full of interesting local shops and eateries, before rising up the steep residential hills overlooking a quaint harbour full of colourful boats and the lighthouse. Mevagissey has an impressive collection of shops for a place of its size, from the surprisingly trendy Brocante with its gorgeous gifts and homeware to The Leather Shop with its great range of top quality bags, shoes and slippers. David Weston Gallery is the place to go for local artwork, and of course there’s the obligatory Cornish Fudge Shop. When you’re ready to rest your feet and have a bite to eat, you’ll find plenty of choice, whether you want a snack or a full three course meal. For afternoon tea with a view of the harbour, you can’t beat Tea on the Quay, where the delicious cakes are all home made and you can even get a cream tea to take away. The mother and daughter team who run the cafe use local ingredients wherever possible, and there’s a map on the wall showing where everything comes from, which gets fuller every time you visit. For something a bit more substantial – or a pint of Cornwall’s best scrumpy – head to The Fountain Inn, a 15th century establishment that oozes history and serves excellent pub grub as well as takeaway fish and chips. You’ll often find the owner chatting away with guests in one of the two bars, and on a Monday night you can listen to the Mevagissey Male Voice Choir practicing here. Speaking of history, if you want to find out more about Mevagissey’s past, head to the Mevagissey Museum, housed in an 18th century building that was once used to construct and repair vessels used for smuggling. There are lots of old photos and local relics on show, chronicling the village’s fishing and boat building past, as well as memorabilia celebrating one of the village’s famous sons, Andrew Pears, who invented the clear soap that still bears his name. If Mevagissey’s fishing heritage has inspired you to try a spot of sea fishing yourself, why not charter a boat and give it a go? You can set out on your own if you’re feeling brave, or employ the services of a local fisherman to guide you. And that’s not all there is to do outdoors on a sunny day. Situated in a compact valley within the Cornwall Area of Outstanding Natural Beauty, Mevagissey boasts some great cliff walks along the South West Coast Path. Head north towards Pentewan and – if you can face the 200 or so steep steps – head down to Mevagissey’s ‘secret beach’ where you’ll always have peace and quiet. Alternatively go south from the village and carry on past the headland to Chapel Point where you’ve got a good chance of spotting a few seals basking in the sunshine. A 40 minute walk inland will take you to the famous Lost Gardens of Heligan, 200 acres of garden and estates that are among the most popular in the UK. Open every day except Christmas Eve and Christmas Day, Heligan also has a fantastic tea room, where much of the food comes straight from the garden, as well as a well stocked shop and plant centre. 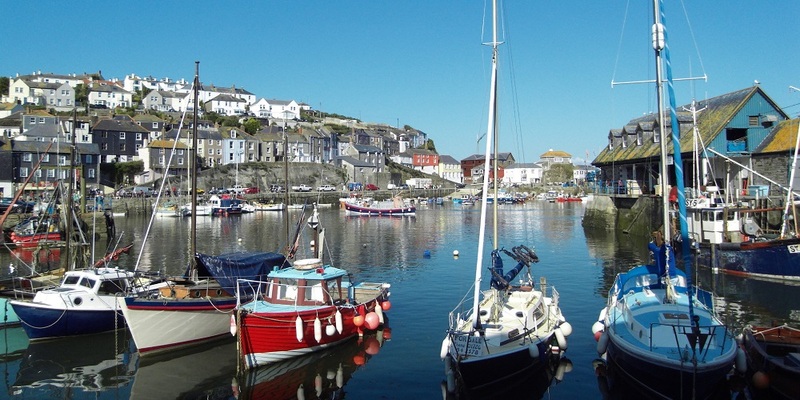 Mevagissey is a must-see spot at any time of year but, if you can, try and time your visit for Feast Week in June. This festival has been going for hundreds of years and includes a vibrant carnival, floral dances, fireworks and of course plenty of food – head down to the quay where you’ll find locals cooking fish straight off the boat, and make sure you try the traditional ‘mackerel in a bun’ before you leave.